First available in 1983, the Beaufort jacket, designed by Chairman Dame Margaret Barbour, is one of Barbour's most iconic waxed jackets, featuring the useful full-width, lined, rear Game Pocket. Fully interactive with a detachable hood and liner, the Beaufort truly is the ultimate, classic all-year-round jacket. Made with mediumweight 6oz Thornproof waxed cotton and featuring Velcro wind cuffs and the recognisable studded corduropay collar, the Beaufort is made to work hard in all weathers. 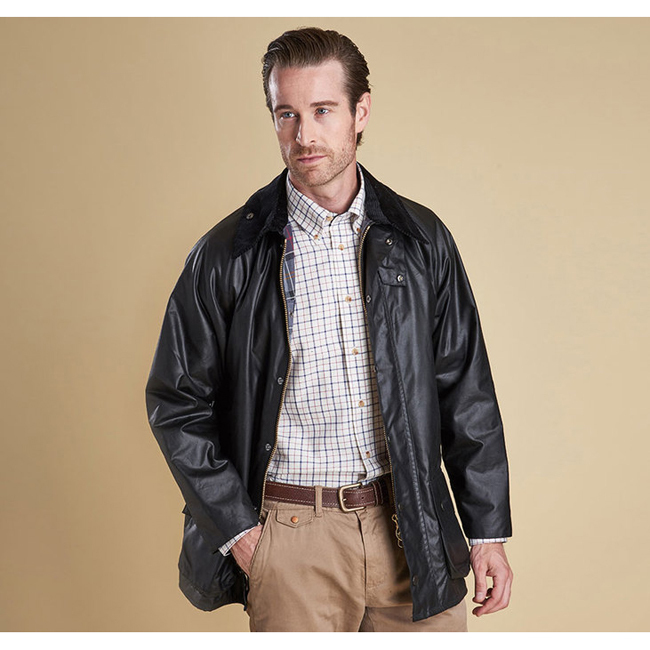 The classic-fit jacket features a chunky two-way Barbour ring-pull zip and studded 'Stormfly' close front, two generous bellows pockets and two waist-height moleskin handwarmer pockets for everyday practicality. Inspired by French shooting jackets, the Beaufort is a shorter length than traditional jackets, and carries a large rear pocket lined with wipe-clean polyamide, suitable for carrying small game, cartridges, or even a newspaper when in town. Recently, the Beaufort found a renewed popularity in the film 'The Queen', in which, actress Helen Mirren wore the jacket in her role as HRH Queen Elizabeth II.